Yale scored on six straight possessions down the stretch, breaking open a close game en route to a 78-65 victory over Pennsylvania before a big and boisterous alumni weekend crowd at its John J. Lee Amphitheater within the Payne Whitney Gym. Thanks to losses by Princeton and Harvard, Yale now occupies sole possession of first place in the Ivy League at 5-1. The Bulldogs have won 11 of their last 12 and are 15-4 overall. Going back to last season, Yale is undefeated in 13 straight home games. In this one Yale led by 10 points with less than nine minutes remaining, but Penn cut the margin to three before Yale pulled away to 78-64 with 1:33 left. The Bulldogs shot 49 percent from the field and held the Quakers to 35.1. They outscored Penn 33-4 on fast break points. 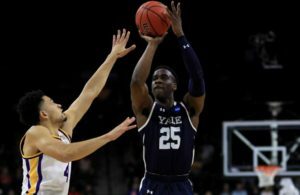 A 21-point performance capped a memorable weekend for pro prospect Miye Oni, fresh off a career-high 35 in Yale’s win over Princeton the night before. He also had eight rebounds and five assists against the Quakers. Devin Cannady showed his Princeton teammates what they were missing while he was serving a nearly one-month suspension. In his second game back he led all scorers with 24 points and grabbed nine rebounds. But it was all for naught as the Tigers were upset by Brown 14-8, 2-4 Ivy), 78-70, at the Pizzitola Sports Center in Providence. As a result Princeton (12-7, 4-2 Ivy) fell out of a first place tie after their second loss in as many nights. 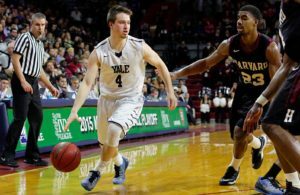 Yale, which was beating Penn after a victory over Princeton 24-hours earlier, now holds sole possession of the top spot. Although Brown had a big lead, 55-38 with about two and a half minutes into the second half, the Tigers managed to cut the deficit to five points twice, the last time 72-67. But the Bears boosted their advantage to 10 points with 1:52 remaining and four foul shots at the end to guarantee the win. Brown sophomore George Mawanda-Kalema, of Burk, Va., scored a career-high 19 points and senior Obi Okolie, of Ajaz, Ont. (Canada), had 18. Brown shot 50-percent from the field (27-for-54) opposed to Princeton’s 39-percent (25-of-64). Harvard (11-10, 4-2 Ivy) may have run out of gas and Cornell seized the opportunity to hand the Crimson one of its infrequent loses at Levities Pavilion under Coach Tommy Amaker, 67-61. It came 24 hours after Harvard won a grueling triple overtime struggle over Columbia, also at home. Cornell was down by 13-points at halftime, but the teams reversed their roles after the break. In the second half Cornell scored 46 points, including seven 3-pointers. Harvard committed 24 turnovers and producing just three assists in the second half. Bryce Aiken scored a game-high 24 points, but only seven in the second half, when he had five of his seven turnovers. The 13-point lead quickly went down to five in the matter of two minutes as Cornell (12-10, 4-2) quickly chipped into its deficit. Steven Julian’s 3-pointer with 8:47 to go tied the game at 47, and the two went blow for blow the rest of the way. Matt Morgan’s three-point play gave Cornell a 62-59 lead. Harvard cut it one point. But after a missed triple with 58 seconds left, Terrance McBride hit a three with 33 seconds to go that gave Cornell a 65-61 lead. Columbia, after an emotional three overtime loss to Harvard on Friday, may have had too little left in the tank at Leede Arena in Hanover to give Dartmouth (11-11, 2-4) much resistance the next night. That and 21 points by Brendan Barry, a freshman from Fair Haven, N.J., who is related to NBA great Rick Barry, were crucial as the Big Green won, 82-66. Barry’s total included three treys. 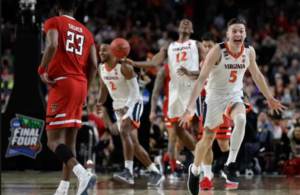 The teams, in effect, exchanged four game losing streaks. Dartmouth came in with one and Columbia left the same way. Patrick Tape had 14 points but Gabe Stefanini, from Bologna, Italy, who was averaging 14 points a game for Columbia, scored only two points (1 of 7) in this one. Dartmouth built a 31-17 lead in the first half that Columbia reduced to a 10-point margin, before the Big Green pushed it to 39-25 at the break. The Lions were without a field goal for the first 5:07 of the second half, and Dartmouth increased its lead to 31 points with 8:20 remaining.